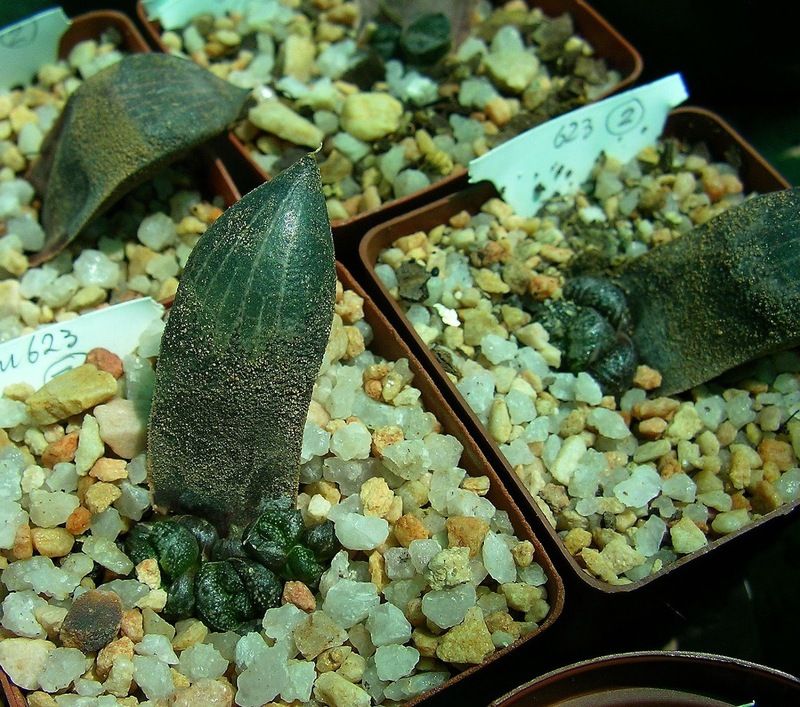 Haworthia correcta corrected and how it impacts upon the names H. picta and H. emelyae. Almost weekly pictures of Haworthia bayeri are posted on Internet Haworthia discussion groups labelled ‘Haworthia correcta’. It seems that the ‘correcta’ label found particular appeal in Japan as many Japanese Haworthia collections still contain H. bayeri plants labelled as H. correcta. 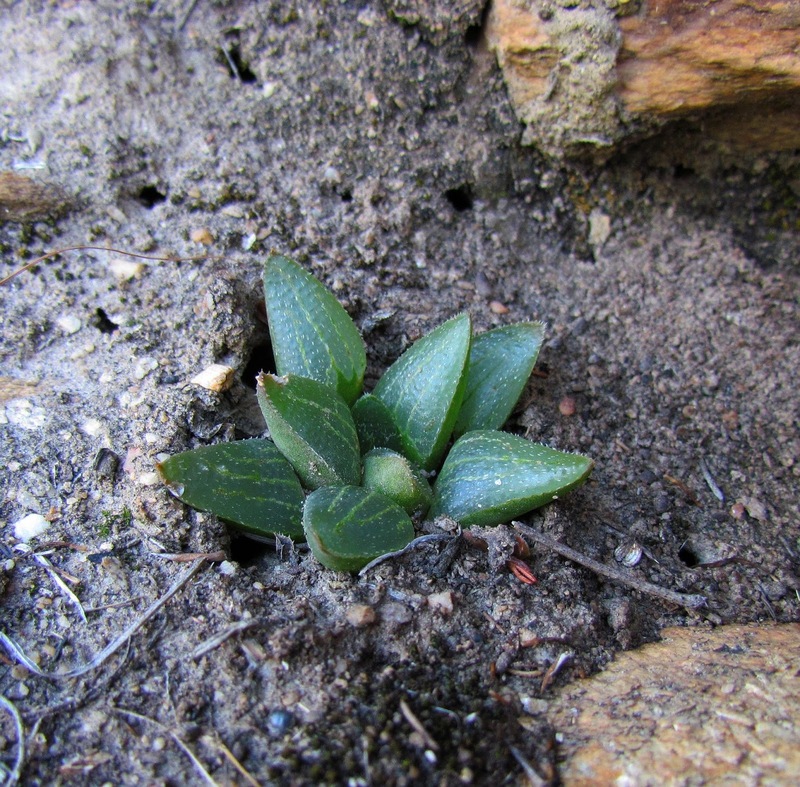 However, the photograph below is of a plant corresponding fully to the original description and photo of the type plant of Haworthia correcta. If you find this confusing or surprizing, read the text below. The origins of the name ‘Haworthia correcta’ Poelln. 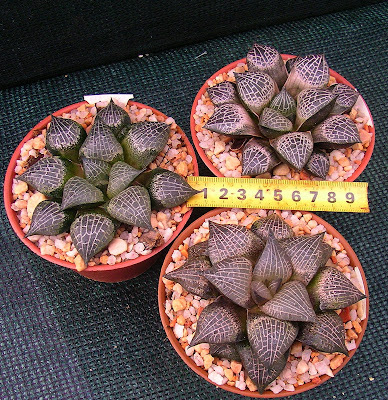 · Firstly, the name Haworthia correcta was originally applied to the specimen Triebner 978 which clearly represents the species we currently refer to as Haworthia emelyae /H. picta/ also H. tricolor) . The name ‘correcta’ was applied as correction to replace the name ‘blackburniae’ which had been used already at the time. A photo of the original publication of H. blackburniae in Kakteenkunde. On the right is the enlarged and clearer photo of the Triebner 978 plant. The picture above shows the original Triebner 978 plant that had been collected by Mrs E. Blackburn near Calitzdorp and which was published in 1937 as Haworthia blackburniae by Von Poellnitz in Kakteenkunde (9):132. Soon afterwards Von Poellnitz realized that W.F. 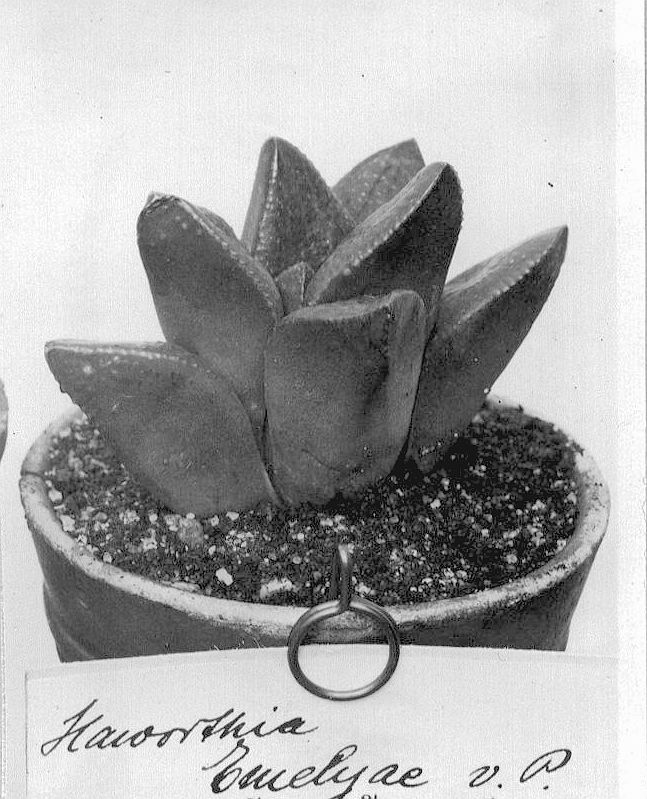 Barker had published the name Haworthia blackburniae for another Haworthia species only a few months earlier. W.F. Barkers’ H. blackburniae is the grass-like leaved species we still recognize today. The latter also grows near Calitzdorp. Von Poellnitz then corrected the error by renaming the Triebner 978 specimen Haworthia correcta in Feddes Repertorium 43 page 103 in 1938. There should be little doubt with anyone familiar with these plants that the Triebner 978 specimen was a plant of the species we now refer to as H. picta/ emelyae/ tricolor. The black and white photograph of Triebner 978 shows a rather poorly cultivated specimen clumsily potted and protruding above ground but the shape of the leaves are clearly that of H. picta/ emelyae with flecked and very subtly pimpled upper windows bordered by toothless margins and opaque leaf-sides. Most characteristic is the upward-curving sharp leaf-tips ending in a sharp bristle. Why then, may one ask, don’t we currently refer to H. picta/ emelyae as H. correcta and how on earth did Haworthia bayeri get mixed up in the mess? The confusion seemed to have originated with Col. C. L. Scott who initially referred to the plants we know today as H. bayeri as H. willowmorensis V. Poelln. but later he became convinced that the original collection of H. correcta was near Uniondale and proposed that H. correcta should be the correct name for these plants. Scott wrote that Mrs Blackburn had indicated to him that the original collection of H. correcta/ willowmorensis was at Uniondale. In addition, he also suggested that the name H. emelyae be discarded upon grounds that it was insufficiently known and of doubtful origin and without exact locality. The confusion was then strengthened and continued by M.B. Bayer who strongly defended the name H. emelyae and explained in a 1979 article in the National Cactus and Succulent Journal, 34:28 that G. G. Smith’s records indicate that his G.G. Smith 5437 ‘H. emelyae’ had been collected by a Mrs Le Roux of Vanwyksdorp who then gave it to Mrs Emely Ferguson who passed it on to Smith. Bayer published a photo of the latter G.G. Smith 5437 specimen with the article and apparently he could not see that the photograph of the G.G. Smith 5437 specimen was the same type of plant as the Triebner 978 ( H. correcta) specimen. He even argued that perhaps the latter was a form of H. turgida. This is actually very ironic, since the original H. emelyae (Long 322) specimen looks far more similar to H. turgida than the H. correcta Triebner 978 specimen. However, perhaps his confusion was influenced by the fact that the old Fourcade photographs that were taken in 1941 included photos of plants that are clearly H. turgida and one (Fourcade 242) was labelled “H. correcta, Riversdale’ while two other photos also of H. turgida are labelled ‘H. emelyae, Riversdale, ex Ferguson’ and another ‘H. emelyae , Gamka River ex Geldenhuys’ ( Fourcade 144). Bayer also mentioned a photo by Dr G.J. Broekhuisen in the Fouche collection involving the same misidentification. Fourcade photos: ‘H. emelyae, Ferguson, Riversdale’ 1941 ( left), ‘H. correcta, Riversdale’ centre and ‘H. emelyae, Geldenhuys, Gamka River’ 1941 on the right. All are various forms of H. turgida. It should also be pointed out here that at the time Bayer’s focus seems to have been fairly undefined and sketchy as he did not see H. emelyae (incorporating H. picta ) and H. bayeri as separate elements. In the above-mentioned 1979 article in the National Cactus and Succulent Journal he published photos of H. bayeri from Dysselsdorp as well as H. bayeri from Uniondale both labelled ‘H. emelyae’. As a result of M. B. Bayer’s failure to recognize the differences between H. bayeri and the H. picta-type emelyae , people inevitably started using the most conveniently available name to differentiate the bayeri type, which was Col Scott’s name ‘H. correcta’. So that is how it happened that the name H. correcta became such a widespread label to indicate H. bayeri. Only in 1997 did J.D. Venter and S.A. Hammer correct the situation by giving H. bayeri separate species status. Haworthia bayeri ( Uniondale form) in cultivation. Let us take a brief but more detailed look at the various elements involved in the complicated confusion surrounding the names Haworthia correcta and Haworthia emelyae. Several names got dragged into the confusion and these were H. blackburniae, H. correcta, H. emelyae, H. willowmorensis, H. emelyae var beukmanii , H. turgida, H. ryderiana, H. picta and recently the name H. tricolor was also added to the list. Both H. correcta and H. blackburniae have been explained and illustrated above, so there is no need to re-discus them below. 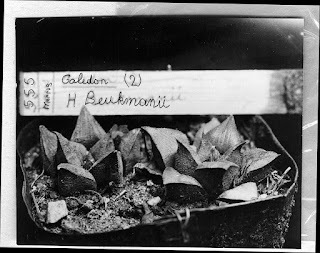 The original photo and description of the plant that Von Poellnitz described as H. willowmorensis strongly suggests a variant of H. mirabilis (Published in Feddes Rep. 41 in 1937).Firstly the plant’s leaves are less strongly recurved than found in any H. picta or H. bayeri forms. The leaves are described as green above and greenish red below and the lower leaf surfaces are described to have “oblong tubercles arranged in longitudinal rows from the middle to the tip”. Furthermore, the leaf edges and keels are described having minute teeth. Triebner 840, the type plant of H. willowmorensis that appeared with the original publication of the species. All these features suggest H. mirabilis, however the locality was erroneously given as “Willowmore, collected by Mrs Helm”. No specimens of these plants have ever been found near Willowmore and remain extremely unlikely to have come from that area. 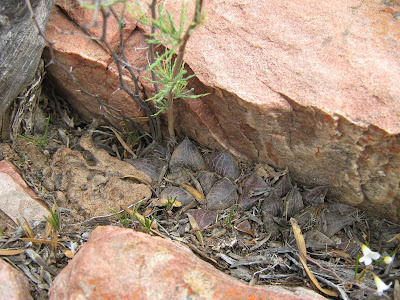 Typical H. mirabilis in habitat between Greyton and Genadendal, north of Caledon. In an article in ALOE 11(4) 1973 : 42-44, Colonel Scott gave the name ‘willowmorensis’ prominence by publishing a full re-description of it based upon plants he had found near Uniondale and which he then believed to be H. willowmorensis. The description that Col. Scott published differed totally from the original description and he simply used the name ‘willowmorensis’ and applied it to his own description of the plants (H. bayeri) that he had found at Uniondale and which to him was a close enough locality to Willowmore to justify the identification. In fact, today it is known that a form of H. bayeri actually does occur much closer to Willowmore on Vaalkrantz farm, within a stone-throw from H. comptoniana . It should perhaps also be mentioned that Colonel Scott’s initial concept of H. willowmorensis incorporated H. correcta V. Poelln. and H. atrofusca G.G. Smith. as synonyms of H. willowmorensis and he gave the distribution to include localities like Willowmore (= H. bayeri) ,Uniondale (= H. bayeri), Oudtshoorn ( =H. bayeri ), Springfontein (= H. breueri or H. multifolia, presumably) towards Barrydale and Riversdale (= H. atrofusca). Haworthia emelyae var beukmanii Poeln. As mentioned above, Von Poellnitz’s original description and accompanying photo of H. willowmorensis was clearly that of H. mirabilis. So, Von Poellnitz’s concept of H. emelyae was evidently much closer to a H. mirabilis -type of plant than to the H. picta kind. This also explains why he published H. picta only a year after H. willowmorensis as a totally different species and in his notes he did not compare it to H. emelyae at all. A few years later during 1940, Von Poellnitz also published a variant of H. emelyae, the variety beukmanii in Feddes Rep. 49: 29. The description, photos and locality of this variety indicate without any doubt the plants we know today as Haworthia mirabilis var beukmanii. Long 555 , the original specimens of H. emelyae var beukmanii. H. turgida Haw. and H. ryderiana Poelln. It was mentioned above that the photo of the original Long 322 specimen of H. emelyae does seem to correspond more closely to H. turgida than to the general H. picta type plant. It was also mentioned above that the 1941 Fourcade photographs of ‘H. emelyae’ are clearly H. turgida and another, Fourcade 242 labelled “H. correcta, Riversdale’ is also H. turgida. Two other old photos also of H. turgida are labelled ‘H. emelyae, Riversdale, ex Ferguson’ and another ‘H. emelyae , Gamka River ex Geldenhuys’ ( Fourcade 144). 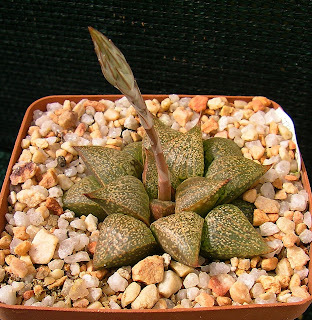 It is in particular Haworthia turgida var suberecta that corresponds most closely to the Long 322 photo of H. emelyae. 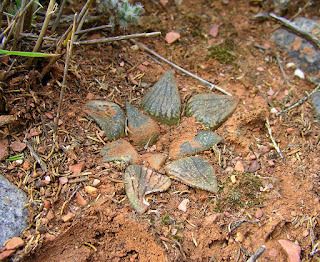 Haworthia turgida var suberecta at Brandwag. The plants are very variable, ranging from solitary to clustering, long-leaved to short-leaved, rosettes with few leaves to others with more, etc. A selection effort at this locality may yield plants that come much closer in appearance to the Long 322 specimen of H. emelyae than the one in the picture above. 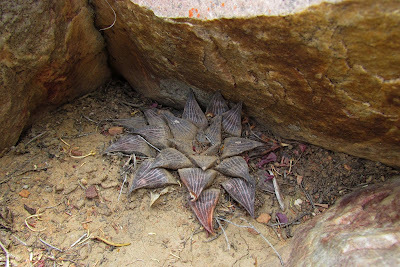 Haworthia turgida is of course a very variable element mostly confined to almost vertical hillsides and it seems to be somewhat connected throughout its range to a few slightly larger and solitary-growing species found on the flats and gentle slopes of low hills. Around Riversdale H. turgida links with H. retusa and in areas it appears to be a clustering cliff-dwelling variety of H. retusa. Eastwards there is an undeniable link to the H. turgida/ asperata-type plants on the steep hills west of Herbertsdale and the H. pygmaea var argenteo-maculosa plants on the coastal flats and further east there is the H. turgida var suberecta around Brandwag and Hartenbos dam which also links somewhat to H. pygmaea var argenteo-maculosa. 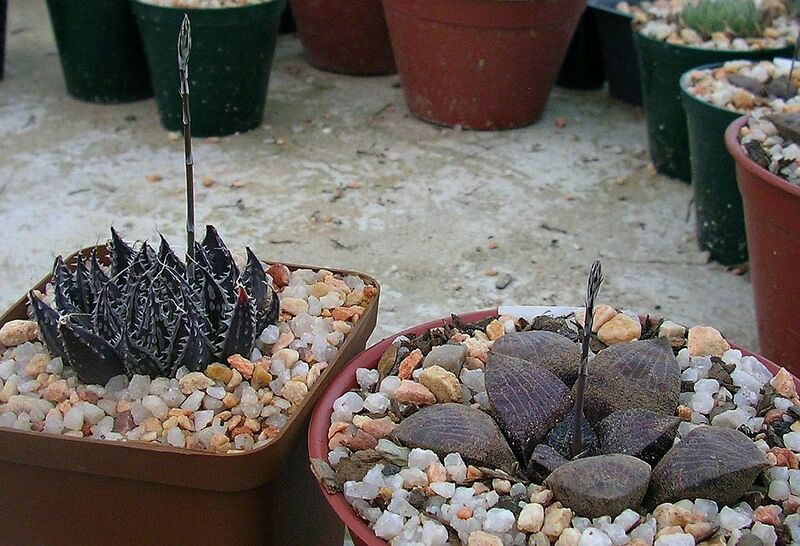 Haworthia turgida/ asperata from Towerlands, west of Herbertsdale. Another H. turgida-like element quite comparable to the original description of H. emelyae. The H. turgida-like Long 322 plant almost appears as if it could well be a similar cliff-dwelling element linked to H. picta. But this is pure speculation, of course, as no such population is known to date. It remains a distinct possibility that somewhere along some steep banks of the Gamka-, Wabooms- or Gouritz rivers such a turgida-like link to H. picta may hide un-rediscovered. The H. emelyae type plant Long 322 in the centre compared in black and white pictures to H. turgida var suberecta from Brandwag ( left) and MBB 7105 from N/E Ouvloere on the right. Haworthia ryderiana Poelln. was described in 1937 in Desert Plant Life 9:103 from a plant sent to Kew by Mrs Ryder of Durns, England and Von Poellnitz compared it to his H. emelyae, H. willowmorensis , H. cuspidata ( presumably H. turgida or a form of H. retusa) and H. mirabilis. Authors like J.R. Brown, M.B. Bayer and C.L. Scott all rejected the name H. ryderiana as ‘species non statis cognitae’ while Ingo Breuer claims that it was possibly a garden hybrid. Fact remains, the photo and description of H. ryderiana are more similar to H. turgida than to a H. picta type plant. As a result of the foggy and complicated origins of the name H. emelyae, many collectors and Haworthia enthusiasts have been using the name H. picta during recent times. Ingo Breuer also gave it preference and it is indeed a handy, descriptive and unambiguous label for the glabrous brown-green plants with flecked windows and sharply pointed leaves. H. picta Poelln. was originally published in 1938 in *Feddes Rep. 44:133 from a specimen numbered Triebner 1063 which had also been collected by Mrs S. Blackburn and with habitat data mentioning “Moeras River near Little Brak River”. Triebner 1036, the Type plant of H. picta. It remains a mystery that H. picta was published during the same year as H. correcta and only a year after H. emelyae and H. willowmorensis, so Von Poellnitz dealt with all these specimens over the time period of a number of months and yet they seemed to him to be different enough to publish them as separate species. However, at least in the case of H. picta, Von Poellnitz had more or less correct habitat data (although Moeras River is much closer to Oudtshoorn than to Little Brak River) and the photo and description published with the article on H. picta in Desert Plant Life 10:127 match the plants known to occur near Moeras River, south of Oudtshoorn. As mentioned, one of the authors who also decided that the name H. emelyae was not justified to uphold and preferred to recognise H. picta is Ingo Breuer. In 2004 Ingo went ahead and added two varieties to H. picta : H. picta var janvlokii and H. picta var tricolor. Ingo Breuer is an excellent researcher and archivist who had sorted through all available old literature and assembled and organized all these historical names and descriptions into two tremendously convenient and invaluable volumes ‘The World of Haworthias’ (1999). As taxonomist Ingo Breuer also attempted the very brave effort in subsequent books to re-evaluate the many species described by Dr Hayashi and integrate these with the drastic reductionist approach of M.B. Bayer. The solution that Breuer used to achieve this without having to re-describe and officially re-combine the many Hayashi species as subspecies or varieties, he came up with the concept of Aggregate groupings. This implied that he abandoned all previous subspecies and variety rankings and made ‘species’ the end status. That is how it happened that in his 2010 species list H. comptoniana, H. tricolor and H. janvlokii became species under his ‘Aggregate Picta’. H. janvlokii is the very smooth-leaved and slightly larger-sized variant growing on the hills east of the Kammanassie Dam. It is in many aspects transitional towards H. comptoniana. A plant of ‘H. tricolor’ Breuer in habitat near Assegaaibosch, east of Vanwyksdorp. This is also the locality of M.B. Bayer’s Epitype for ‘H. emelyae’. H. tricolor refers to the population on the foothills of the Rooiberg east of Vanwyksdorp and south of Calitzdorp. As mentioned above, this might have been the original locality of H. correcta and it is also the locality of M.B. Bayer’s designated *epitype for H. emelyae. The G.G. Smith 5437 specimen mentioned above under H. correcta seems also to have been from this locality. With other words, Breuer’s H. tricolor involves the exact same locality and plants as Bayer’s epitype for H. emelyae. So what then, one may ask, should be done about the name H. emelyae that still seems to enjoy frequent use as a result of M.B. Bayer’s persistent application of the name? The plant size is given as 40 mm in diameter, which is smaller than the regular H. picta type plant that is on average 70 mm (and up to 90 mm) wide. The average solitary H. turgida plant is 40 mm in diameter though. The leaves of H. emelyae are described as being green in colour, oblong in general shape, broad at the base, erect or little spreading, with the leaf-tips ‘obliquely truncate’ and the leaf margins and keel having ‘minute, somewhat confluent teeth’. The triangular leaf-top (end area) is described to have ‘somewhat pellucid tubercles which are sharply pointed on the younger leaves’ and the window area has ‘three longer and fewer shorter lines of which only the middle one reaches the tip’. When above description is compared to the general H. picta type of plant, the following differences stand out: the H. picta plants have darker more brown-green leaves, not erectly spreading but strongly recurved, the leaf margins have no teeth. On the rae occasion when teeth are present they are extremely inhibited and hardly visible. In H. picta type plants there are no sharply pointed tubercles on the young leaves and although the window area does have lines these are often not clearly visible, being somewhat obscured being crowded by dense flecking. Most important also, are the sharp acuminate leaf-tips of H. picta plants ending in a frequently upward-curving end bristle. It remains very difficult to believe that the Long 322 specimen was indeed a form of the H. picta type plants and if it was, it was definitely a drastically untypical plant of smaller size, with unusually blunt leaf-tips, semi-erect leaves, almost un-flecked windows and with the very rare occurrence of having a few minute suppressed teeth along the margins and keel near the leaf-tips. It is obviously very different from the G.G. Smith 5473 specimen from the well-known Rooiberg locality, 25km east of Vanwyksdorp (the locality for M.B. Bayer’s designated epitype) and it remains rather inconceivable that the Long 322 specimen came from there. 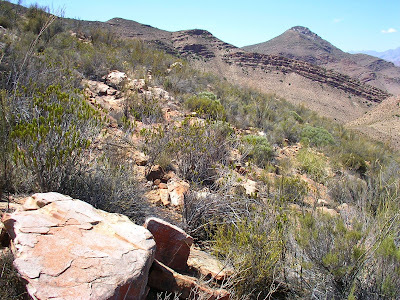 It is marginally easier to accept that if the Long 322 specimen was indeed a H. picta kind of plant collected near Vanwyksdorp, that it could have come from the Arrievlakte locality a few kilometres south of the latter town. The Arrievlakte form of H. picta/emelyae in habitat. The Arrievlakte population of H. picta/’ emelyae’ is somewhat different in certain respects and both the plants and locality differ from all other known populations of the species. 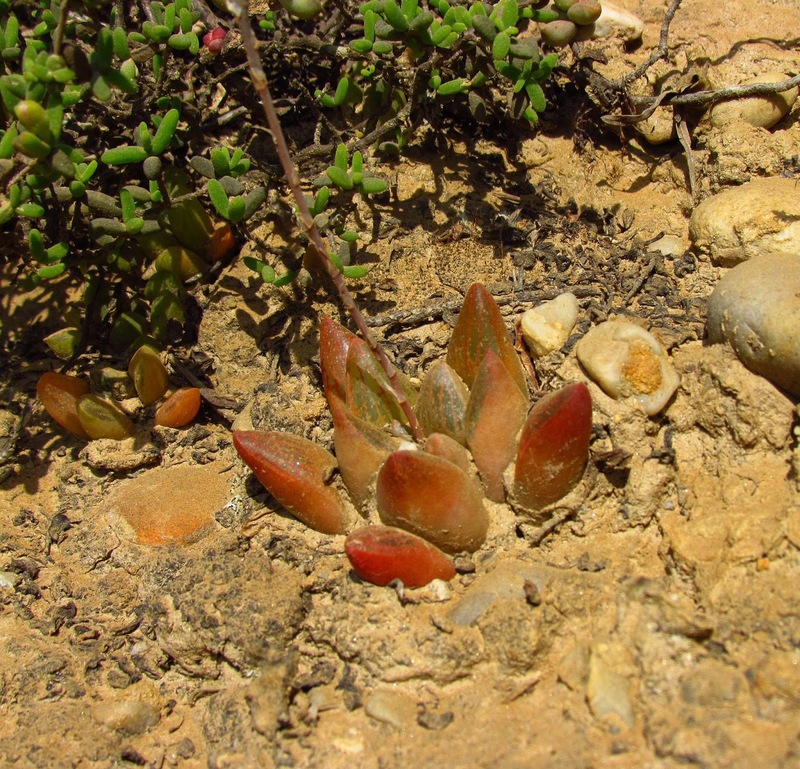 These Arrievlakte plants grow in a very arid situation on shale scattered with quartzite and amongst dwarf succulents like Gibbaeum dispar, Crassula columnaris and Avonia papyraceae. The haworthias at this locality are extremely well camouflaged, being dull reddish-ochre to dark brown in colour in the wild and blending very well with the soil colour. The dark Arrievlakte form of H. picta/’emelyae’ in cultivation. It is particularly in cultivation that these Arrievlakte plants most display their distinctness by having a much darker, almost black-green colour and less dense and variegated flecking in the leaf windows. Of all the known forms of H. picta/’emelyae’, these Arrievlakte plants are perhaps slightly closer in appearance to the Long 322 specimen, provided one allows for rather bold and rough comparison. Not everybody’s interpretation of the old photos and descriptions may agree but even dogged devotees of the name emelyae must agree that it remains a slightly uncomfortable fit, almost like the old joke of the guy who wore a poorly constructed suit but if he lifted one shoulder and walked with a limp, the suit seemed to fit fine. However, the problem is that if one does decide to discard the name H. emelyae like Col Scott who declared it as “of doubtful origin and without exact locality” then the next name with priority would be H. correcta….. Remember that the name H. emelyae was published in 1937 in * Feddes Rep number 42, while H. correcta was published in 1938 in Feddes Rep number 43 and H. picta also in 1938 but in Feddes Rep number 44. This means that the name H. correcta has a very slight priority over H. picta. 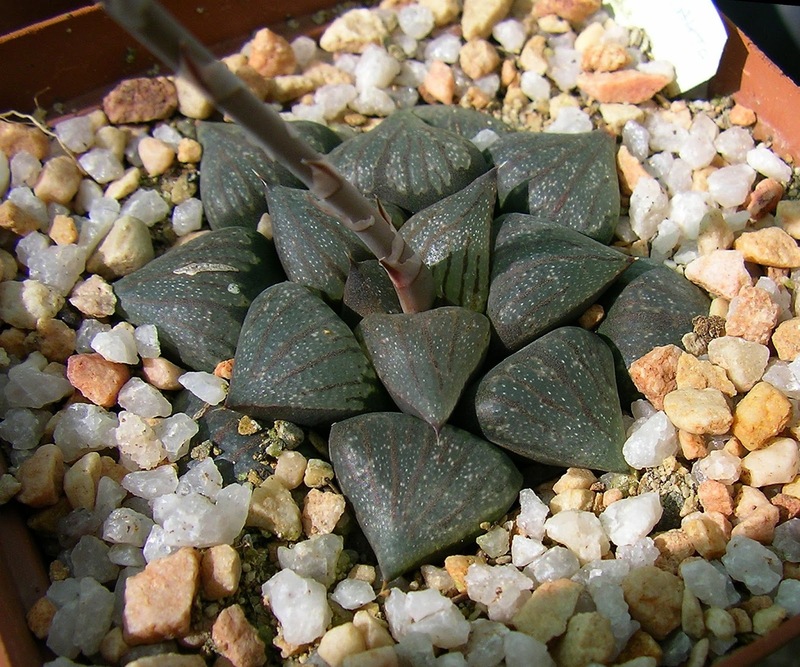 In practical terms, however, it would take many years and lots of quarrelling amongst Haworthia authors, students and enthusiasts to accept the name H. correcta as replacement for H. picta/ emelyae , particularly in view of the fact that many collectors still have H. bayeri labelled as H. correcta ! In addition, the description and photo of the Triebner 978 specimen of H. correcta have been studied by all Haworthia authors to date and somehow none of them seemed to have been nearly as convinced as I am that the plant is indeed of the H. picta type, so perhaps in view of this persistent cloud of distorted doubt and misinterpretation, the name correcta should also be totally discarded. Besides, there is, like in the case of H. emelyae, also no preserved specimen or precise locality. Therefore, the advantages of applying the name H. picta are numerous as there are no doubts regarding the precise features and locality. Furthermore, the name ‘picta’ is very suitable and descriptive of these plants and the Moerasrivier area is also reasonably central within the distribution range of the species and it is quite suitable to consider the Moerasrivier plants as typical. Consequently the best solution seems to be to use the name H. picta, as many people have already been doing. *Epitype- An epitype is a specimen or illustration selected to serve as an interpretative type when the holotype, lectotype, or previously designated neotype, or all original material associated with a validly published name, is demonstrably ambiguous and cannot be critically identified for purposes of the precise application of the name of a taxon. * Feddes Rep – Feddes repertorium specierum novarum regni vegetabilis. * 1937 – W.F. Barker published Haworthia blackburniae in the Journal of South African Botany 3:93. The type specimen ( Reynolds1842) was collected by Mrs Blackburn south of Calitzdorp and sent to Dr Reynolds. This is the thin grass-like leaved plant known today as H. blackburniae. 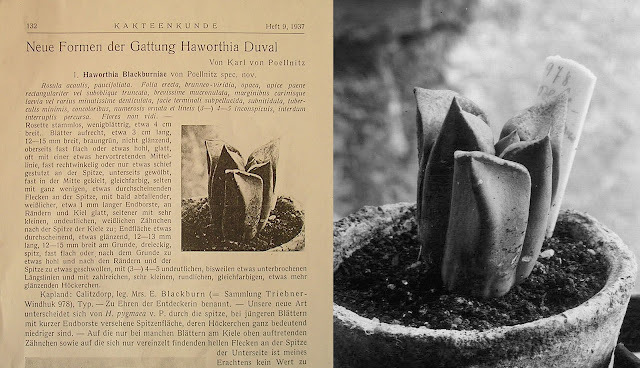 * 1937 – Later that year Von poellnitz also published a plant named H. blackburniae in Kakteenkunde 9:132, but his description and photo of the plant (Triebner 978) matches that of what is known today as H. emelyae/picta/tricolor. The Triebner 978 specimen was also collected by Mrs Blackburn, near Calitzdorp. 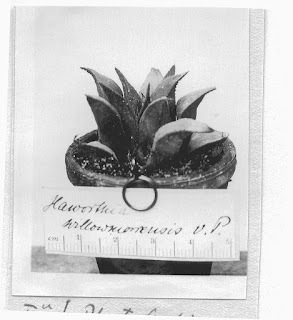 * 1937 -Also during the same year Von Poellnitz published Haworthia emelyae in Feddes Rep 42) from a plant received from F.R. Long that originally came from Mrs Emely Ferguson but without exact locality. * 1937 – A plant that seems to match our current understanding of Haworthia mirabilis was also published in the same year by Von Poellnitz as Haworthia willowmorensis. The plant (Triebner 840) came ex Mrs Helm reportedly from Willowmore, but the locality must certainly have been an error. * 1938 – Von Poellnitz has since discovered that the name H. blacburniae had been used before his publication, so he simply corrected the error by replacing the name for the Triebner 978 specimen with H. correcta in Feddes Rep 43. 1938- Later the same year Von Poellnitz also published Haworthia picta in Feddes Rep 44 from Triebner 1063, also originally sent to Triebner by Mrs S. Blackburn and reported from Moeras River area. 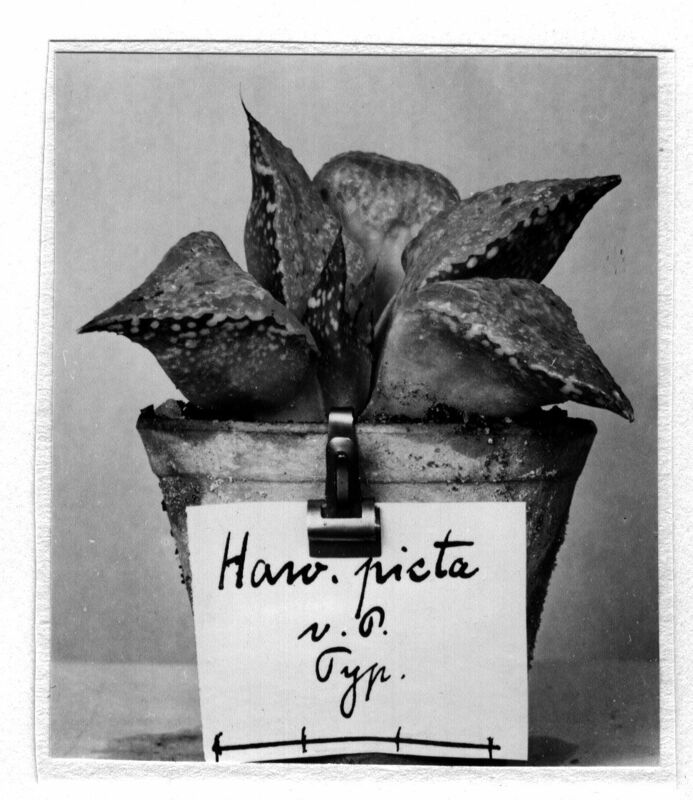 Somehow Von Poellnitz could not see that this H. picta plant was the same species as his H. correcta. * 1940 – Von Poellnitz published the Long 555 specimen from Caledon area as Haworthia emelyae var beukmanii in Feddes Rep 49. This is the same plant known today from the Caledon area as H. mirabilis var beukmanii. * 1965 – J.R. Brown publishes an amended description of Haworthia emelyae in Cactus & Succulent Journal (USA) 37:114. Both the photo and description of J.R. Brown’s H. emelyae indicate a form of H. mirabilis. * 1973 – Colonel C.L. Scott wrote in ALOE 11(4) that he had learnt from Mrs S. Blackburn that the original plant of H. correcta had been collected near Uniondale. 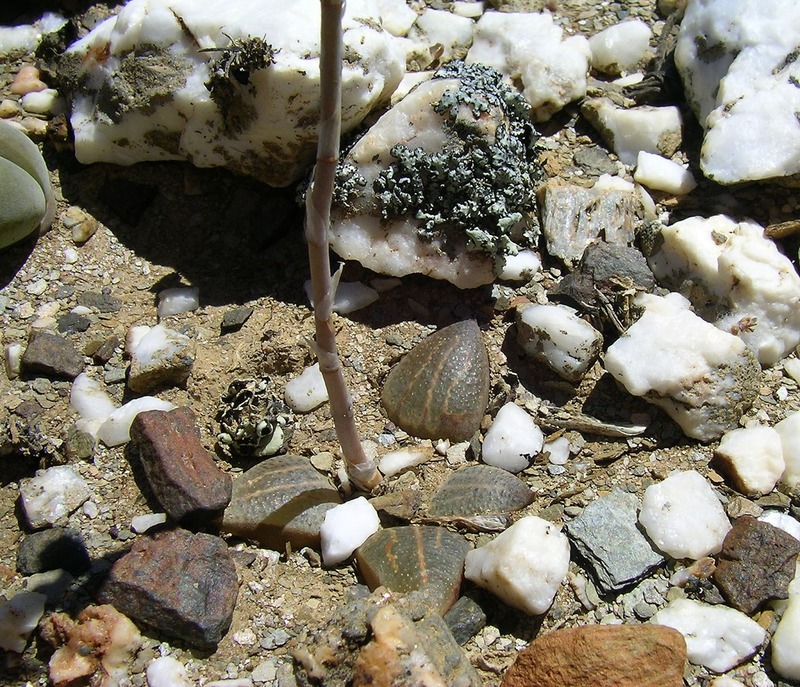 He then concluded that H. correcta must be synonymous with Haworthia willowmorensis with Uniondale being not too far from Willowmore and no plants matching H. willowmorensis to be found in the Willowmore area. Col. Scott then went ahead and simply ignored the original description and picture of H. willowmorensis and re-described H. willowmorensis according to the Uniondale plants and even added a photo of the Uniondale plant (known today as H. bayeri) labelled H. willowmorensis. 1979 – M.B. 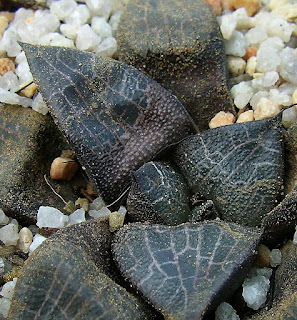 Bayer adds to the confusion by publishing photos of the above-mentioned Uniondale plants as ‘Haworthia emelyae’ in his article ‘Natural Variation and Species Delimination in Haworthia Duval. Part 4: Haworthia emelyae Von Poelln. and a new variety’ in the National Cactus and Succulent Journal 34 (2). Bayer also considered H. picta as synonymous with H. emelyae and referred to the H. bayeri plants from Dysselsdorp and Uniondale as ‘more scabrid and with rounded leaf end areas’. 1985 – Colonel C.L. Scott’s book was published wherein he finally rejected the name H. willowmorensis and decided in favour of H. correcta. So, the beautiful colour photograph of H. bayeri in Col. Scott’s book is labelled H. correcta. Therefore, as a result of M.B. Bayer’s refusal to see the dull-grey, scabrid and rounded-tipped leaved plants (H. bayeri) as different from H. emelyae ( including H. picta) , people started using Col. Scott’s name H. correcta to differentiate. 1979- J.D. Venter and S.A. Hammer finally corrected the situation by publishing the Uniondale, De Rust, Dysselsdorp, etc. area plants Haworthia bayeri in the Cactus and Succulent journal (U.S.A.) 69:75. * 2004 – I. Breuer publishes two varieties of H. picta in Alsterworthia International Special Issue 7: 20 - 22. These were H. picta var janvlokii and H. picta var tricolor. 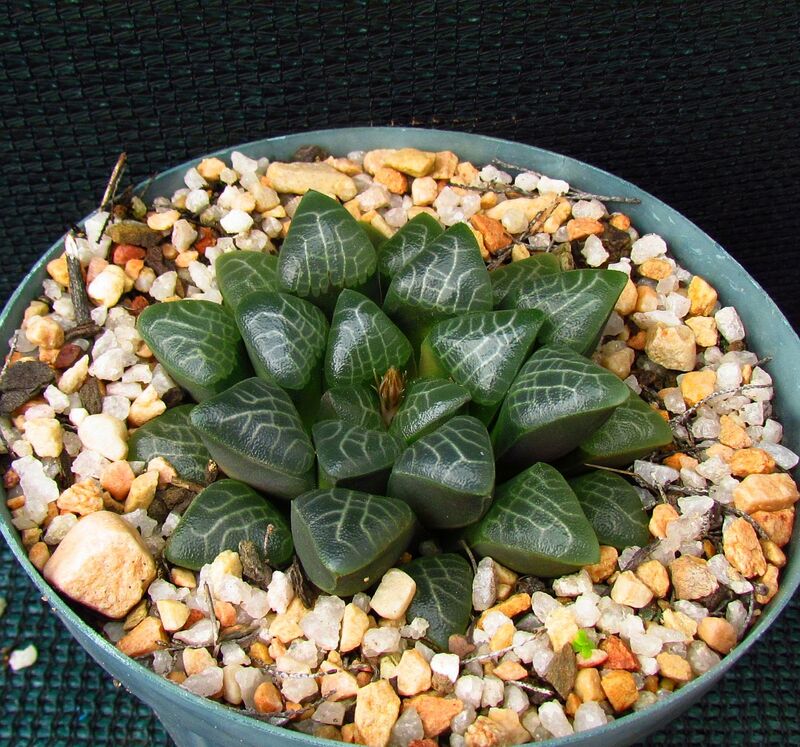 * 2010- Alsterworthia International publishes Ingo Breuer’s ‘The Genus Haworthia’ Book 1 wherein he does away with all ranks below species and his ‘Aggregate Picta’ then includes H. picta, H. comptoniana, H. tricolor and H. janvlokii. Bayer, M.B., 1979. Natural Variation and Species Delimination in Haworthia Duval. Part 4: Haworthia emelyae Von Poelln. and a new variety. National Cactus and Succulent Journal 34 (2): 28-31. Bayer, M.B., 1999. Haworthia Revisited. Umdaus Press. Breuer,I. 2000. The World of Haworthias Vol. 2. Arbeitskreis fur Mammillarienfreunde e.V. (AfM), Niederzier and Homburg/Saar. Breuer, I. 2004. 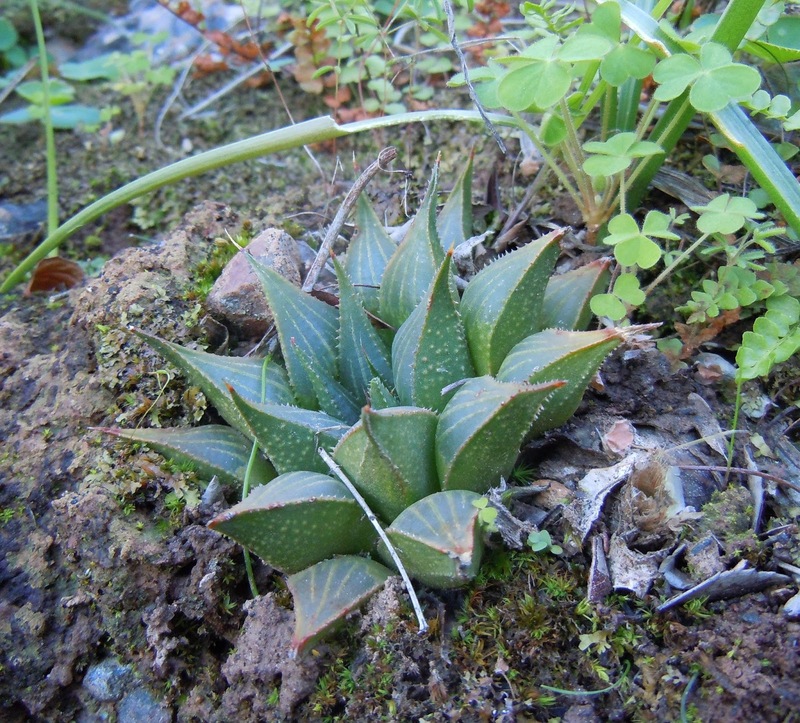 New Haworthia species/combinations published subsequent to Haworthia Revisited. Part 1. Alsterworthia International Special Issue 7 :3-33. Breuer, I. 2010. The Genus Haworthia. Book 1. Alsterworthia International. Brown, J.R. 1965. H. emelyae. C & S Journal of America 37: 114. Marx, Gerhard. 2009. 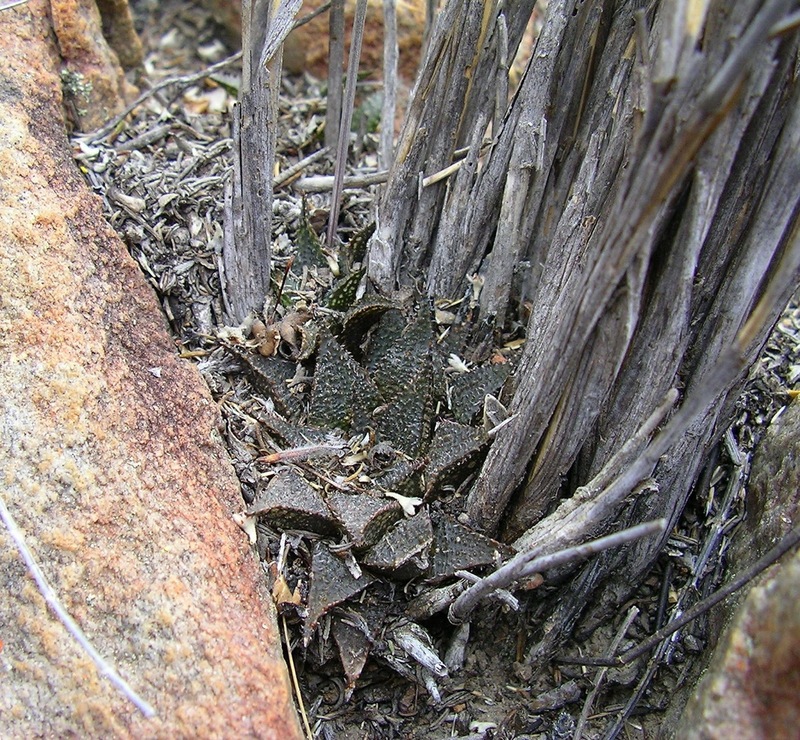 Haworthia emelyae, the ‘Klein Karoo Kliprosie’. ALOE 46(4): 67-95. Scott, C.L. 1973. A Revision of the Genus Haworthia, Section Retusae. ALOE 11 (4): 8-45. Von Poellnitz, Karl. 1937. Neue Formen der Gattung Haworthia Duval. Kakteenkunde (9): 132-134. Von Poellnitz, Karl. 1937. Zur Kenntnis von Haworthia Duval. Feddes repertorium specierum novarium regni vegetabilis 41: 216. Von Poellnitz, Karl. 1937. Vier neue Haworthia-Arten . Feddes repertorium specierum novarium regni vegetabilis 42: 271. Von Poellnitz, Karl. 1938 . Three Interesting Species of the Genus Haworthia Duval. Desert Plant life. July 1938 : 125-127. Von Poellnitz, Karl. 1938. Haworthia Duval: Scabrae Berger, Retusae Haw and Coarctatae Berger. Feddes repertorium specierum novarium regni vegetabilis 43: 103. Von Poellnitz, Karl. 1938. Neue formen der Gattung Haworthia Duval. Feddes repertorium specierum novarium regni vegetabilis 44: 133. Von Poellnitz, Karl. 1940. Zur Kenntnis von Haworthia Duval. Feddes repertorium specierum novarium regni vegetabilis 49: 29. An honorary Ariocarpus in Africa. Notes and updated information regarding Haworthia marxii S.D. Gildenhuys. It is both exciting and very frustrating to have such a unique Haworthia named after oneself. This species is truly a unique and exciting phenomenon that begs to be properly studied and discussed. For various reasons I remain one of a handful of people who had the opportunity to study it closely in the wild and in cultivation to date. And yet, the frustrating part is that any discussion offered for publication by myself might immediately be interpreted as an egotistical obsession with the plant purely because it was named after me. A few years ago, after becoming familiar with this strange and unique Haworthia, I informally referred to it as Haworthia ariocarpioides. That was also the name that I recommended to Sean Gildenhuys when he decided to formally publish the species. Today, ten years later, I am even more convinced that H. ariocarpioides would have been a very appropriate name. 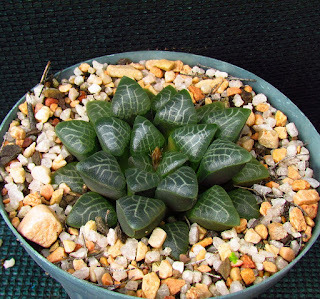 H. marxii has proven to be by far the slowest and most challenging Haworthia within the subgenus Haworthia to grow and propagate. It also shares the flattened spreading tubercles-like leaves, dull dark colour and slightly scabrid epidermis of Ariocarpus cacti including the feature of having dirt and debris sticking to the newer growth in the wild. As a result of its slow and difficult propagation, H. marxii is still relatively unknown and very rare in cultivation and enthusiasts can’t be blamed for not knowing what to think of it. 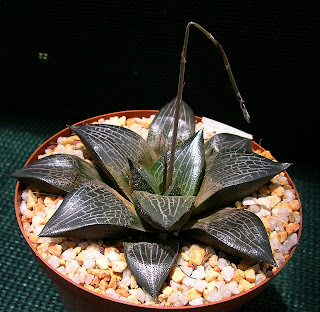 Haworthia publications during the past ten years were not any help either, as it is clear that several authors did not quite know what to make of it. Initially the easiest solution seemed to have been to reject it as synonymous with H. bayeri on basis of a few shared features or the geographically closer H. emelyae/ picta. In The 2009 ‘haworthia for the collector’ book of Rudolf Schulz, H. marxii was simply listed in the appendix as a synonymn of “H. pygmaea var. splendens “(sic) !? One can only wonder in amusement how on earth such a far-fetched combination was reached! Fact remains, time always gradually reveals the truth and in some recent species lists it has been recognized as the unique and interesting phenomenon it is. The history of the discovery of this species was fully discussed in an article in ALOE 44:2:2007 (34-37). In short, it was first found during the late 1980’s but not successfully grown or properly studied and efforts to recollect it were unsuccessful. 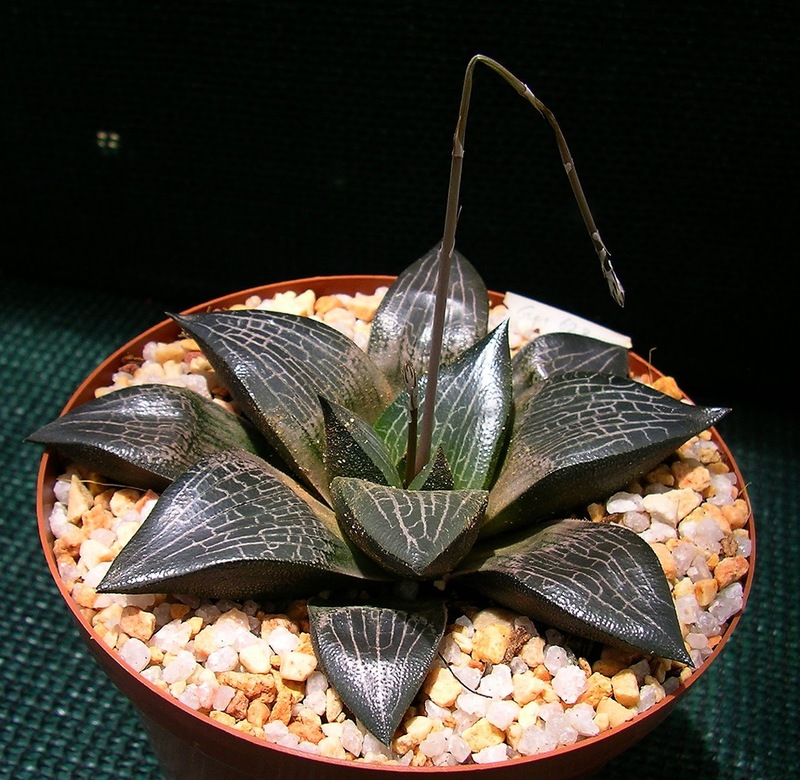 It seemed to have become largely forgotten during the 1990’s although Bayer briefly referred to it as a form of H. bayeri in Haworthia Revisited (1999). The locality was given as the Rooinek pass, south of Laingsburg, which is more than 150 km to the north-west of the known distribution of H. bayeri. This seemed such an unusual occurrence which begged for proper investigation. As a result I did numerous and unsuccessful searches for a number of years before finally locating it during 2005. 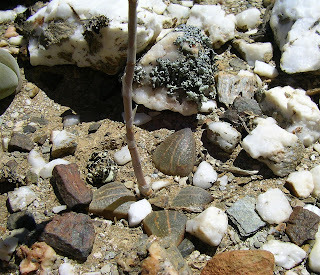 The main reason for my many fruitless pursuits was that I was searching for the usual type of habitat that retuse-leaved species like H. bayeri and H. emelyae generally occupy: gentle slopes that are densely covered with quartzite or ferricrete pebbles. In contrast, H. marxii grows on rather steep vertical south-facing rock walls and deeply hidden amongst crevices and small pockets of soil. As a result, the plants are mostly growing rather squashed and uncomfortably flattened in these crevices. Only rarely can one encounter a plant that developed in a large enough space to spread its leaves to full extent. A common situation for H. marxii in the wild: tightly compressed in a narrow rock crevice. The largest and most impressive plant encountered in habitat. The elongated leaves remind a bit of H. badia. More than 80% of the plants never receive any direct sunlight and most other retuse-leaved haworthias growing in such shady situations would be fresh green and etiolated. However, H. marxii features a distinct dark purplish-black-green colour despite growing in such very shady situations. Hiding in a dark sheltered situation on a south-facing slope. This plant is one of many that never receives any direct sunlight in habitat. 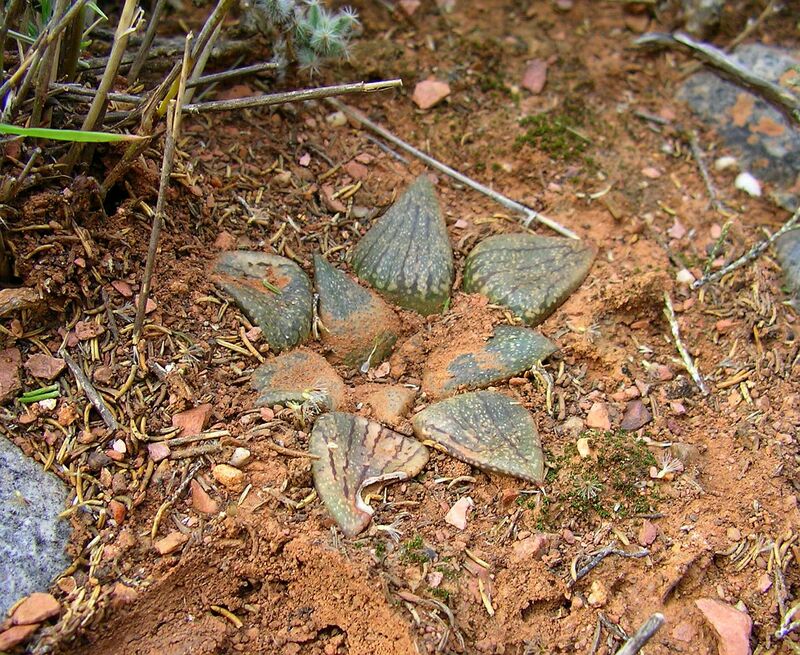 Haworthia wittebergensis also grows in the same general area and a small number of H. wittebergensis plants occur even amongst H. marxii. On an adjacent hill H. wittebergensis grows a bit more numerous and together with a form of H. arachnoidea ( =H. isomorpha Breuer). Intensive searches in the surrounding area yielded several more populations of H. wittebergensis as well as the H. arachnoidea, but H. marxii seems very rare and has not been found outside an small area of about a square kilometre. 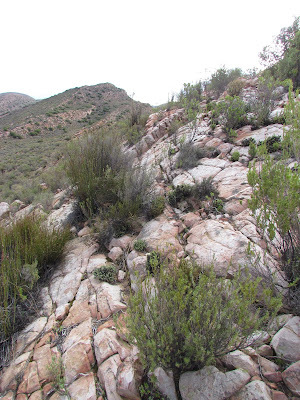 The semi vertical rocks at these habitats are Witteberg quartzitic sandstone and H. marxii shares its habitat with several other succulents like Euphorbia multifolia, a miniature Gasteria (probably disticha), Astroloba smutsiana, Crassula hemisphaerica and Aloe comptonii. 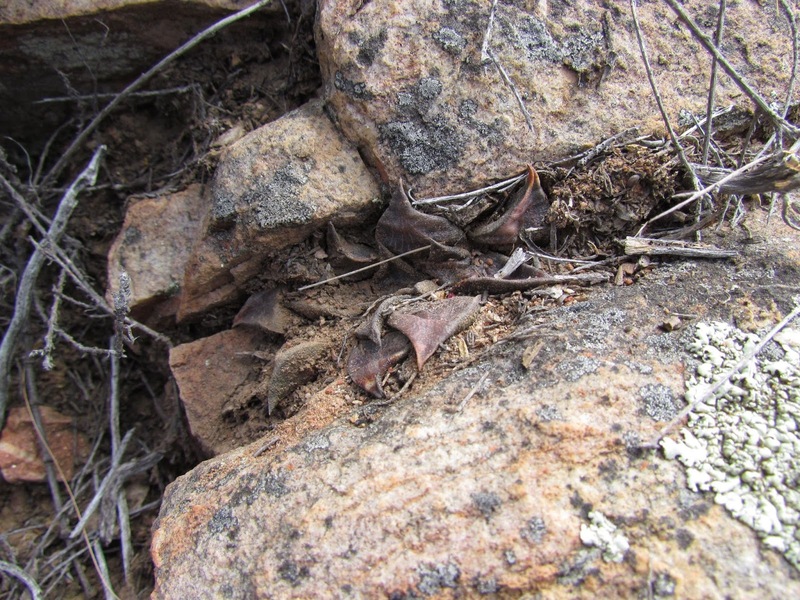 Photographed on an adjacent slope to a H. marxii population: H. arachnoidea (isomorpha) (left picture) and H. wittebergensis (right). 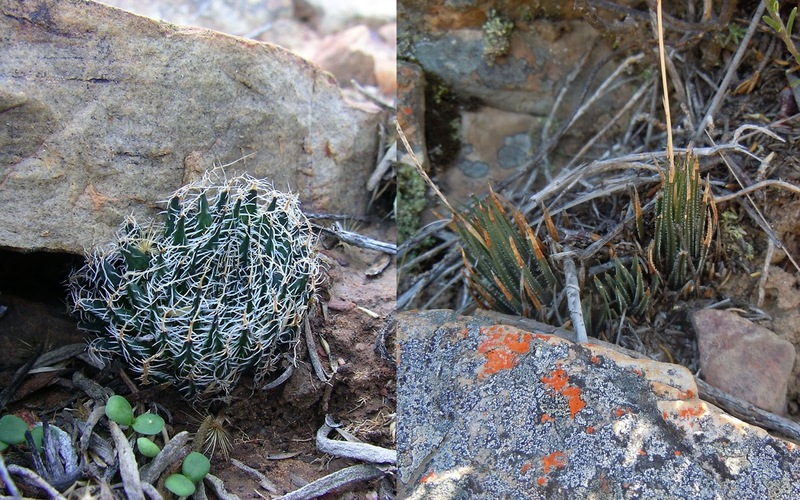 The co-occurrence of H. marxii, H. wittebergensis and H. arachnoidea presents us with an unsolved mystery: All three of these elements are members of the subgenus Haworthia and all three share more or less the same flowering period! Which means there seems no clear reproductive isolation measurement at work to prevent these three components from interbreeding in the wild. And yet, not a single natural hybrid has been seen to date. For example, near Dysselsdorp where H. arachnoidea grows close to H. truncata, quite a few natural crosses have been observed. The other big question that remains concerns the closest relationships of H. marxii. 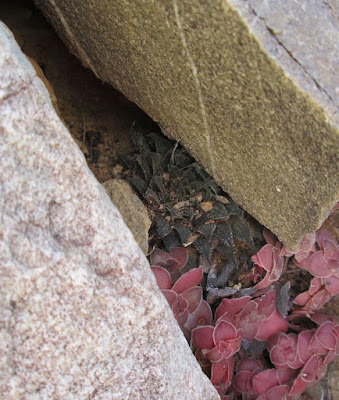 Is it a retusoid element that found an unusual home in rock crevices in the mountains or could it be a H. archeri relative that mimics the retuse-leaved habit? The possible but unconfirmed report of H. emelyae ca 30 km to the south near Ladismith comes to mind but a close relationship with H. emelyae does not seem obvious due to the various morphological and flower differences which will be discussed below. A more likely retusoid link seems with the H. maraisii-mirabilis complex. H. marxii shares to some extent the dark colour normally associated with H. maraisii as well as the thin flower peduncles and mid-summer flowering habit. 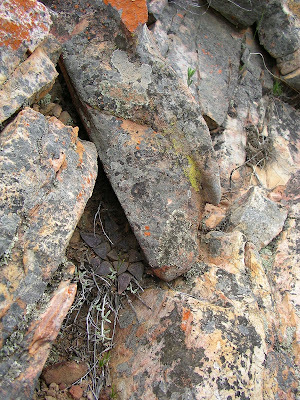 The closest H. maraisii-like element can be found 60 km to the south on Klein Doringrivier farm east of Barrydale. South-westwards towards Montagu H. maraisii occurs again but this is a good 80 km away. However, in terms of flower similarity, it is the form of H. maraisii growing even further away on the Rooiberg west of Robertson that comes closest to that of H. marxii. See illustration below for comparison. Another comparison would be to link H. marxii to the H. archeri-nortieri group. 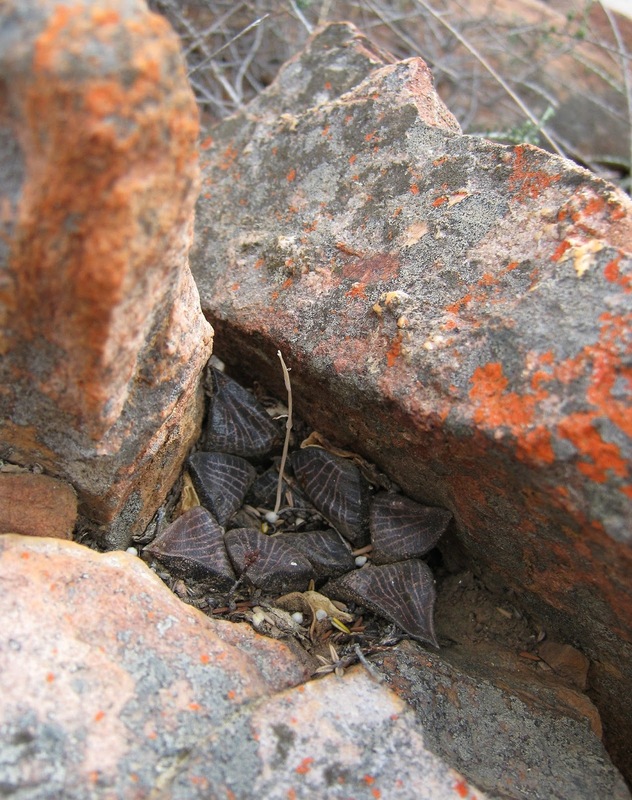 There is a collection of Peter Bruyns (PVB 1405) of a H. archeri-like plant only 20 km to the south-east of the Rooinek Pass. I have not been able to locate this population although it is widespread in cultivation and was given the name H. nudata by Dr Hayashi. Typical H. archeri grows much closer and can be found only 10km north of the Rooinek Pass at Viskuil ( JDV 89-62) . These plants also share the same flowering time and some flower features with H. marxii as well as to some extent, the dark leaf colour. 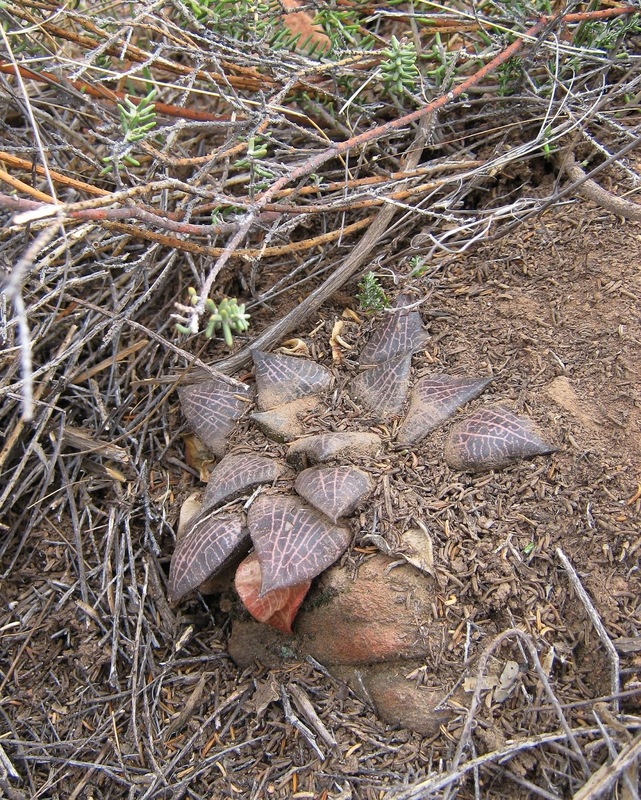 Haworthia archeri growing ca 8km north of the nearest H. marxii to the west of Viskuil. (photo: Martin Scott). However, all above comparisons with geographically close Haworthia populations remain very speculative and none truly convincing. H. marxii is characterized by having very dark-coloured and somewhat flattened swollen leaves, spreading outward as generally found in retusoid species. 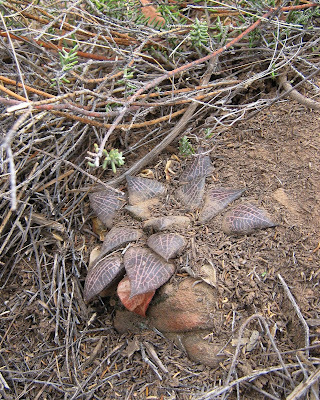 The rosette of H. marxii is therefore much more flattened when viewed from the side than the average retuse-leaved Haworthia. The photos below show such comparisons with H. bayeri and H. emelyae as examples. In H. emelyae and H. bayeri the leaves recurve abrubtly to form a flattened end area above. In H. marxii the recurved angle is rather gradual and less abrupt. Side-view plant profile comparisons between H. emelyae (left) ,H. marxii (centre) and H. bayeri ( right). On above photographs another distinct difference is also visible and that is the poor root system of H. marxii in comparison to the others. It is also this fact that causes H. marxii to be of such slow growth and rather difficult to maintain in cultivation. Seen from above, the facial lines and patterns of H. marxii do remind more of H. bayeri than of H. emelyae . The facial lines are generally thinner and more numerous in H. marxii and the variation in patterning on leaves of the same plant is very noticeable in H. marxii and much less so in H. bayeri. No two leaves are exactly the same in H. marxii. Features shared with H. emelyae is that H. marxii also has some small floating flecks in-between the facial lines which are lacking in H. bayeri and occasionally the facial lines of H. marxii may also have opaque islands inside the lines as in H. emelyae. Detail of a rosette to show that some leaves of H. marxii can have dark opaque islands inside the lighter facial lines. During my initial observations and experiences with H. marxii, and before having seen its flowers, I was convinced for several months that it was a member of the subgenus Hexangulares (now the separate genus Haworthiopsis). This was due to its slow growth, weak roots and vague resemblance to species like H. koelmaniorum, particularly its variety mcmurtryii. Even when the flower peduncles developed for the first time, the very thin flower peduncle was a further reminder of the type found in the Hexangulares. But then the flower buds appeared and opened and I had to stare in amazement that those were not Hexangulares flowers, but typical subgenus Haworthia florets. The florets actually seemed closer in appearance to those of H. truncata than to H. emelyae or H. bayeri. The upper perianth lobes are not curved upwards like in H. bayeri or H. emelyae but straight. This drew the attention back towards H. archeri and in particular its variety dimorpha that also has such straight upper perianth lobes. Side-view plant profile comparisons between H. marxii (left) ,H. emelyae (centre) and H. bayeri ( right). In most populations of H. maraisii the flowers also have upward-curving upper lobes and the flowers are generally smaller with narrower lobes than those of H. marxii. Only recently did I notice the rather close resemblance between the flowers of H. marxii and those of the H. maraisii form growing on the Rooiberg west of Robertson ( =JDV 95-1). The upper perianth lobes of the H. maraisii are still a bit upward curving but less so than in other populations of H. maraisii. The flowers of JDV 95-1 are also larger than the average H. maraisii and compares very close in size to those of H. marxii. Left: Flowers of H. maraisii (JDV 95-1,Rooiberg, Robertson) on the left and H. marxii (GM 623) on the right. Virtually identical except for the slightly upward curving upper perianth lobes in H. maraisii. Right : a typical plant of H. maraisii JDV 95-1 in cultivation. As mentioned above, the thin peduncle of H. marxii also compares closer to H. maraisii and allies than to those of H. bayeri and H. emelyae. In fact, even from the stage when the inflorescence bud first appears from amongst the leaves, the differences are already drastically obvious: those of H. bayeri and H. emelyae are three times more thick and robust than the inflorescence buds of H. marxii and H. maraisii. Then, of course, the time of flowering in the wild is also of significant importance as it is part of nature’s way of keeping elements reproductively isolated. H. marxii forms part of the summer-flowering group which includes amongst the restusoid species the entire H. mirabilis-magnifica-maraisii group as well as H. truncata and its variety maughanii. The first H. marxii flowers open each year during the first week of February if there had been sufficient rainfall. H. emelyae and H. bayeri start flowering in August and flowering can continue throughout September into early October. Similar peduncles and also developing during the exact same time of the year: H. archeri var dimorpha (left) and H. marxii (right). It should be mentioned that above discussion of H. marxii was presented in the logical sequence which involves the discovery and familiarizing oneself with any newly discovered element. First one is naturally confronted with the specific geographical situation which should obviously be considered against the presence of other known Haworthia populations in the surrounding area. At the same time one inevitably studies and compares the plants morphological features to other known species. However, often the plants as encountered in the wild do not reveal the full extent of their inherent features and those may only become apparent after observing it in cultivation over time. One can’t for example tell from brief habitat observations what the growth rate of a plant is and how easy or difficult propagation from seeds might be. Then, lastly, detailed observation of flowers and flowering time needs to be documented as this is often the most important barrier used by nature to ensure reproductive isolation. Therefore, when it finally comes to any taxonomic decisions to be made, the above-discussed sequence of discovery and familiarizing automatically gets turned around and the formal documentation involves working backwards through these facts, from the less obvious and finer specific details of the reproductive organs to the obviously observable general plant features and geography. With other words, flowers and flowering time needs to be considered first, then plant morphology and lastly the geographical situation. Anyone who propagates haworthias from seeds will know that most summer-flowering species are a bit more reluctant to produce lots of fruit and seeds. The only exceptions are H. truncata and it var maughanii. Most of the H. magnifica and H. mirabilis members tend to produce rather thin peduncles bearing fewer and more delicate flowers and fewer fruits. This is why, for example, that very few growers have problems producing and propagating seeds of the spring flowering species like H. bayeri, H. emelyae, H. mutica, H. retusa, etc. But when it comes to H. splendens, H. badia, H. maraisii and H. magnifica, few people manage to propagate them in large quantities from seed. H. marxii leaf-propagations in progress. The reasons are numerous. In some areas the ambient air humidity during mid- summer may be too dry or too humid. In very dry areas, the Haworthia pollen simply desiccates and ‘crystallizes’ into useless granules. In areas with high summer rainfall and air humidity, the flower peduncles of many haworthias may wilt and collapse before flowers can develop. 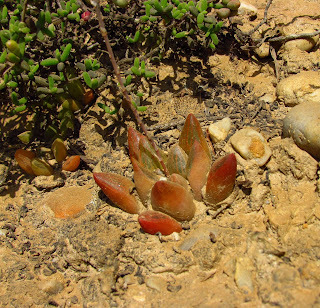 In fact, the wilting of peduncles occurs even in such a favourable climate as the Little Karoo and in the case of H. marxii more frequently than in any other summer-flowering Haworthia. The very thin peduncles are also much more prone to the fungus (?) that causes the wilting to occur. A painful sight every summer- a wilting peduncle of H. marxii. It remains a mystery just what kind of fungus causes this. In the wild there are more fruit pests around during mid-summer and Haworthia fruits are a favourite of a small fruit fly that bores holes in the fruit wall and lay eggs inside the seeds. In the South-Western Cape Province and Little Karoo mid-summer is the dry season which also means that browsing animals are more likely to eat the pregnant peduncles of haworthias. Field mice are particularly fond of Haworthia fruits. I often said that it is a miracle that most of these summer-flowering haworthias manage to reproduce from seed in the wild with so many hindering factors. In the case of H. marxii, all these mid-summer obstacles apply. Furthermore, the germination rate of H. marxii seeds in cultivation proved to be considerably less than those of other summer-flowering elements. And if that is not bad enough, it has become indisputably clear that the growth rate of H. marxii seedlings is the slowest in the entire subgenus Haworthia. Seedlings sown on May 7th 2008 still measure 4 cm wide and has not reached flowering maturity after 7 years ! Seedlings of H. splendens and H. badia sown on the exact same date are now fully mature ‘old’ parent plants, flowering and producing seeds each year for the past 4 years. Fortunately it is possible to propagate H. marxii from leaves and although it takes about a full year before the leaf starts producing offsets, they do develop a bit faster than seedlings. Gariep plants in Pretoria soon realized that the best way to produce H. marxii in quantity would be with the use of tissue culture. For a few years all tried and tested techniques to propagate H. marxii from tissue culture failed but finally during 2010 the tissue culture laboratory was successful. Successful maintenance of H. marxii in cultivation is also dependent upon realizing the specific requirements of the species. Quite a few essential pointers can be obtained by studying how these plants grow in habitat. Not only do these plants grow on relatively steep shady south slopes, but they even hide well hidden in crevices or underneath shrubs. When grown in strong light in cultivation, H. marxii will shrivel and turn brown and lose roots. To bring such a plant back to plump healthy condition is difficult and can take many months. In contrast to most other haworthias that are quick to regrow roots, H. marxii is very slow and reluctant to do so. This shade-loving character may ironically mean that growers in areas of the northern hemisphere who normally struggle to give their plants enough light may find H. marxii quite happy in a relatively dark greenhouse. Habitat of H. marxii. A relatively steep southern slope consisting of sandstone boulders with the plants hiding deep inside the crevices and in soil pockets amongst the rocks. The area south of Laingsburg is transitional in more than one aspect. It is the transitional area between the Little Karoo and the Great Karoo and also the beginning of a gradual change between summer and winter rainfall areas. To the north of Laingsburg summer rainfall starts to dominate while to the south most rainfall occurs during the cooler months. Rainfall peaks occur during late fall and early spring. Although the average rainfall in the specific mountainous habitat area of H. marxii is higher than in the very arid surrounding flats, it is still quite low, roughly between 8 inches ( 200mm) and 12 inches ( 300mm) per year. Therefore, although water must be given very sparingly, watering throughout the year may be necessary for H. marxii. It grows near the top of the Rooiberg Mountains south of Laingsburg at 1 100 m altitude and surrounded by lots of solid rock surface. This means that the plants must surely benefit from water runoff during rainfall and even condensation on these rocks during misty weather conditions. Being on a steep slope, the drainage must also be quite significant which means the plants are never in a soggy wet situation. Mature plants of H. marxii in cultivation showing the variation in leaf patterns and dark colour despite being grown below 80% shade cloth. Summer temperatures at 1 100 m altitude are also a bit less severe than on the lower lying areas, where it can regularly climb to over 40ºC during January to March. In addition and as mentioned, H. marxii hides well-shaded on the cooler south-facing slopes. The minimum temperatures experienced at the specific habitat may also be less severe than in some flatter areas at that altitude. The 1100m altitude is a bit too low to receive snow during winter although it may probably happen once or twice during a century. Still, winter nights drop regularly to below freezing at that height during mid-winter and might even fall as low as minus 4 ºC. But, being situated on a slope and on a high hill-slope, it is unlikely that it may get so cold where the plants hide. I would therefore not recommend allowing H. marxii to experience temperatures below 0ºC in cultivation, probably better to keep them above 4ºC. It must also be remembered that although many haworthia populations in the wild may regularly experience 0ºC or little lower in the wild, the duration of such low temperatures is very short, only about two to three hours before sunrise and as soon as the sun rises, the temperatures rapidly climb to above freezing. Such frosty nights always occur during cloudless weather that allows such severe heat loss radiation to take place overnight but that also guarantees a sunny day to follow with a midday temperature of just above or below 20º C.
Another important factor is ventilation. It is clear that these plants demand a situation where air can flow freely and in the wild there is almost constant air movement. During a visit to the habitat Martin Scott and I tried to determine why it was that the population of H. marxii suddenly stops at a certain point westwards along the hill slope despite the fact that the habitat continues unchanged. Then we realized that at that specific point the wind breaking effect of a parallel and adjacent hill to the south-west could be felt. This suggested that H. marxii is only growing where there is direct effect from the regular and cooling south-westerly wind. The soil mix for H. marxii should be very well drained, more so than for the average haworthia. Best results were obtained in a mix of 80% perlite with the remaining 20% being sifted leaf mould or sifted loam. Both loam and well broken down leaf compost work equally well. Looking eastwards from the top of the hill slope where H. marxii grows. Although Haworthia marxii is not outstandingly attractive in terms of collectors appeal it must be one of the most interesting and puzzling elements within the genus. It’s unexpected and unusual geographical situation in addition to a combination of unique morphological and flower features that are not clearly linked to any known species places it in the same category as H. springbokvlakensis for example. In fact, it may be easier to justify the inclusion of H. springbokvlakensis into H. emelyae than it would make sense to attempt a forceful inclusion of H. marxii into the latter. Gildenhuys, S.D. 2007. Haworthia marxii (Asphodelaceae, Aloaceae), a new species from the Little Karoo, South Africa. ALOE 44(1) : 4 -8. Marx. G. 2007. 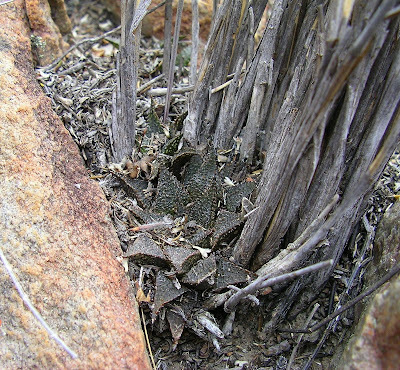 The hidden mystery Haworthia of the Rooinek Pass revealed. ALOE 44(2) : 34 – 37. Branches of a shrub moved aside to reveal a large specimen of H. marxii growing below it. Note the flattened habit of the rosette. No more space for expansion. H. marxii tightly packed inside a small opening amongst the rocks.